Flavor: The strong smell carries over to the flavor. IBC has a stout and very traditional flavor. I notice a lot of licorice in the flavor with some vanilla adding smoothness. It has a very slight medicinal aftertaste that is just enough to be noticeable. Conclusion: There’s a reason you can find IBC Root Beer all over the place. It’s a brew that’s easy to like. It has a flavor that puts it on the high end of mainstream root beers. It’s definitely better and more refined than an A&W or Barq’s, but it’s not quite good enough to break into the top ranks. That said, it’s a great root beer to enjoy with food or as a float. 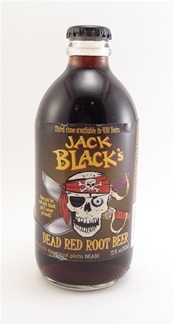 The strong flavor makes sure that whatever you are eating it with does not overpower the root beer. If you ever need a root beer that will be a sure crowd pleaser, IBC Root Beer should definitely be on your short list. Bottle and Label: It’s a keg! Same basic design as the Virgil’s bottles. Well done, traditional, and it looks good on the keg. Smell: This brew has the strongest vanilla smell that I have encountered in a root beer. There are also some licorice hints, but they are almost overpowered by the vanilla. It’s not a bad smell, it just seems like it could use a little more balance. Carbonation: Low level of carbonation makes this brew very smooth from start to finish. The low level of carbonation works with this brew thanks to the smooth flavor of the vanilla. The two complement each other well. Head: Since this brew comes from a keg and is poured slowly, there was not much head present. However, I did have a root beer float with this brew and can attest that it makes a nice, foamy float. Flavor: Virgil’s Root Beer Party Keg has a flavor that reflects the smell. It is very strong on the vanilla. This is not bad, but it also means that the traditional hints of wintergreen and licorice that are usually present are largely masked by the vanilla. The vanilla flavor is smooth and the aftertaste avoids bitterness making this a good pick if you like a vanilla flavored brew. Conclusion: Virgil’s Root Beer Party Keg gets some extra points just for being unique. How often do you get to enjoy a root beer from a keg? I bought this for my wife’s birthday party and it was a lot of fun making root beer floats from a keg. That said, the brew doesn’t quite rise to the top of the pack thanks to a flavor that is almost all vanilla and maybe even a bit too sweet. Don’t get me wrong, this brew is great for things like root beer floats and for people who like a strong vanilla flavor, but if you are looking for a brew with more complexity or with a traditional flavor you will have to look elsewhere. I highly recommend the keg for parties as it is a great conversation piece and the root beer is certainly better than average. Bottle and Label: Saint Arnold Root Beer has nice label that looks different than its counterparts. This is probably because the brewery did the label with the same overall design that it does with its non-root beer beverages. The well designed label will make this brew easy to spot on a crowded shelf. Smell: Very strong and pleasing traditional root beer smell with hints of wintergreen and licorice. Carbonation: Medium level of carbonation. This brew has a nice bite throughout, but it does a good job of not overpowering the flavor. Color: Very dark brown that is barely transparent. Overall, a nice color that suggests the brew is neither too strong nor too watered down. Head: Medium head, but very foamy and long lasting when poured into a frosted mug. The head of this brew would lend itself to being very good for root beer floats. Flavor: Saint Arnold Root Beer is a solid brew in the flavor department. It is very traditional and has a very balanced flavor. There are no overpowering flavors present which allows the drinker to simply savor the brew. The brew is very smooth and leaves no bitter aftertaste. The vanilla extract in the ingredient list is the dominant aftertaste and it is very smooth. Overall, I would call this root beer “full flavored” and if you like a brew that is strong, you’ll like this one. Conclusion: Saint Arnold Root Beer is another one of those brews that does everything well. It checks all the boxes and you come away from drinking it knowing that you just consumed a quality beverage. If you like a brew that is straightforward and traditional in terms of flavor, you will like Saint Arnold. If you are looking for a brew to serve at a party or give to friends and family, Saint Arnold would be an excellent choice. You might not like this brew if you prefer a more complexly flavored beverage. This brew comes out of a brewery in Houston, TX (I live in Fort Worth) and is one of the first local brews I have tried (granted, Houston is five hours away but Texas is a big state). Saint Arnold does TX proud with it’s big, full bodied flavor and if you are ever passing through TX, be sure to try and find some. Thanks to the excellence of this brew, Saint Arnold Root Beer earns a coveted “Editor’s Choice” award and takes its place on my shelf among the best root beers out there. Bottle and Label: Traditional brown bottle with a label that is not very distinguishable because the border of the label is also brown. The label touts that it is made with “pure Louisiana cane sugar” and the lid touts that it is brewed in spring water. Smell: Strong traditional smell from the bottle. It has a strong licorice aroma and also a bit of sweetness to the smell that I have not noticed from other brews. Carbonation: A good bit carbonation throughout. It is noticeable from the tip of the tongue to the back of the mouth. However, this brew does a good job of not letting the carbonation overpower the flavor. Color: A very dark brew that is almost black in color. Head: Medium head the dissipates quickly after being poured. Flavor: Abita Root Beer has an interesting flavor. At first it tastes just like an average root beer, but then as it is swallowed and hits the top of the mouth there is a distinct sweetness to the flavor that is not present in other brews that I have tasted. It’s almost like there is just a hint of honey but it is so light that it is hard to distinguish. That hint of honey keeps this root beer from having a bitter aftertaste that I believe it might otherwise have had and helps set its flavor apart from other brews. Conclusion: Abita Root Beer is a generally solid brew. The only place it is really lacking is the quickly fading head. The flavor of the brew, while very traditional, contains just a hint of honey that causes it to stand out from the merely average brews. I also like how this brew was able to step the carbonation up a bit without losing flavor. If you like a brew with some bite, you should definitely check out Abita. Also, if you like your root beer with a bit of honey flavoring, Abita would be a good one to try. Overall, it is easy to recommend this brew. Bottle and Label: Boylan Root Beer has a very attractive bottle. It actually has raised lettering on it. I really appreciate the work that went into making the bottle reflect the pride Boylan takes in its beverages. Carbonation: This brew has a medium-low level of carbonation. In other words, the carbonation is obviously present from the front of the mouth to the back, but it is hardly noticeable at first. Most of the carbonation hits at the back of the mouth. Color: Dark, amber brown color that is barely transparent when held up to light. Overall, a pleasing color for the brew. Head: Very tall and long lasting head when poured. This would be a primo root beer float beverage as the head is one of the best I have seen on a root beer. Flavor: Boylan Root Beer has a very traditional root beer flavor. I suppose the best way to describe the flavor would be heavy or dark. Some brews taste watered down or flat, but Boylan tastes like a root beer from start to finish. There is no bitter aftertasteand the flavor is very pleasing from start to finish. There seems to be just the slightest hint of honey that helps give the brew a smoothness despite the strong flavor. Conclusion: Boylan Root Beer is a solid brew that should be on your short list if you prefer brews with a strong, traditional flavor. This brew’s greatest strength is also its greatest weakness. While I think the flavor is spot on and the carbonation is good, it doesn’t have anything else to help it pull away from the pack. That said, this is a very good brew for you if you are looking for an introduction to gourmet root beer. Starting with something like Virgil’s or Gale’s might be a little off-putting with their slightly less traditional flavors. Boylan, however, would fare well in the hands of a newcomer to gourmet root beer or a veteran. It would also work well as a root beer float brew as the awesome head and strong flavor would be perfect with your favorite brand of vanilla ice cream. If you come across Boylan and you like root beer, it would be hard to go wrong with this brew. Bottle and Label: The most distinctive bottle I have seen to date for a root beer. It has a porcelain stopper to seal the brew and keep it fresh. The label is unique and well designed and attests to the premium nature of the beverage. Smell: Very mild smell from the bottle that is much stronger when poured. Strong wintergreen smell with hints of licorice. Carbonation: Medium level of carbonation that offers some bite on the tip of the tongue and the back of the mouth. Overall, the carbonation is just right as it is not heavy enough to mask any flavor but still offers a bit of kick. Color: Very dark, almost black. This could be because of the molasses in the ingredient list. Head: Medium head that dissipates very quickly after the pouring stops. Definitely not a strong point for this brew. Flavor: Virgil’s Bavarian Nutmeg Root Beer offers up a full and complex flavor that still manages to taste like root beer. The flavor is smooth with no bitter aftertaste thanks to the taste of honey that lingers the longest. Unlike another brew that I reviewed, Virgil’s does a fine job of not letting the honey flavor become overpowering. There is also a nice hint of wintergreen in the flavor to help keep things interesting. Overall, a very balanced brew with an excellent and very smooth flavor. Conclusion: I have to confess, there was a part of me that did not want to like Virgil’s Special Edition Bavarian Nutmeg Root Beer. It was the most expensive brew I have ever purchased and the awards touted all over the bottle seemed a bit pretentious. Well, lets just say that Virgil’s proved it had the chops to back up its fancy bottle and high price. Virgil’s could easily have turned into a convoluted mess with all of the spices tossed in, but instead it turns out to be balanced brew with just the right amount of distinguishing flavors to set it apart from the pack. This might not be a brew you buy every day, but if you are looking for something in a fancy package with a great flavor to impress a date or a fellow root beer fan, look no further than this brew. Virgil’s earns an “Editor’s Choice” award for their outstanding root beer.